The work deals with the strategic and operational aspects of marketing in internet-startups. New technologies such as the internet created new potentials for the digital age and enabled new business models to become vital. After the shock of the dotcom bubble this economy gained traction and constantly evolved. Influenced by newly developed startup ecosystems in the German-speaking countries of Europe, there has been a new wave of founding that brought numerous successful internet-startups to existence. In the understanding of marketing as a comprehensive customer-and market-oriented model of thinking, the work examines which strategic and operational concepts have been applied in successful internet-startups in various stages of their growth. The results give a very realistic picture of corporate practice, which is determined by an intuitive and opportunistic approach in the early stage and an in-creasing professionalization coming with the steady upgrowth. Efficient product development and rapid build-up of the distribution have a positive influence on the time to market. The informal strategy in this phase supports faster product development and thus a shorter time to market. The communication depends on a brand definition and a partially developed product. A faster time to market increases the chances of success (pioneer strategy). 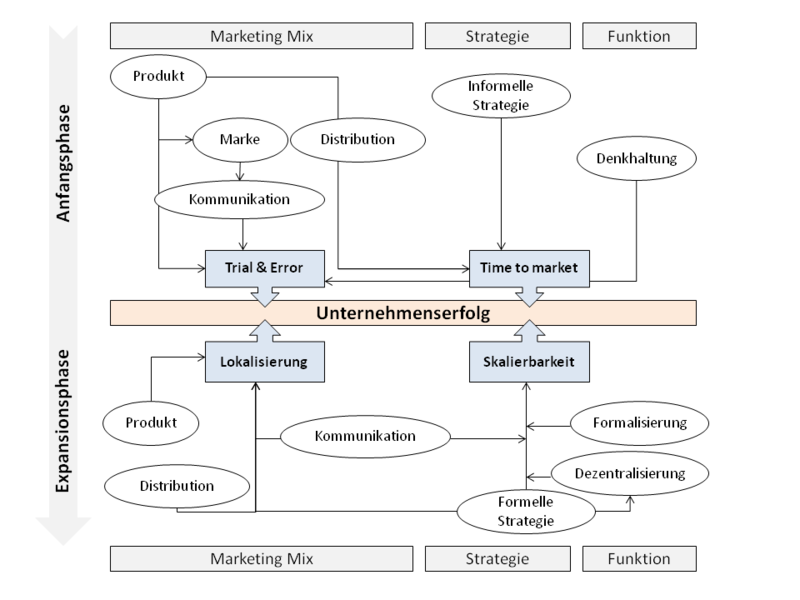 The marketing spirit in the organization promotes error tolerance and allows a trial and error approach. Incremental product development and a constant testing of the communication channels leads to better results (trial and error approach). A formal strategy supports localization and helps to synchronize the different geographical markets. The formal strategy supports the decentralized organization of the marketing team and can coordinate all activities across the various markets. The Product and the communication activities are required to be adapted to each country to work there efficient (localization). The formalized and decentralized organization leads to scalability. Distribution and communication activities must be scalable. The strategy takes the coordinating role of all activities in order to achieve localization and scalability. Scalability is a prerequisite for an economically growth. Opportunistic approach in the early stage. Segmentation and positioning happens as part of a marketing concept. Product development and rapid market entry as the central tasks. Lack of market research is compensated with customer integration. Communication is the main activity in the marketing mix. Use of various communicative channels. The most important communication channels are online marketing, TV and PR. Marketing as a leadership spirit in the company is promoted by the founders. Strategy rather than opportunistic approach. scalability of the core processes is crucial for economical success. Communication is the key element in the marketing mix. Online marketing and search engine marketing are well scalable methods increasingly used. Mass media like TV can be used for rapid growth. The combination of TV and online marketing has been confirmed for e-commerce as the most effective combination. Customer lifetime value and CRM are gaining importance. The product development relies heavily on feedback from the customers. A centralized marketing organization is suitable when operating on a few markets that are very similar. A decentralized marketing organization is suitable for companies with a large number of different markets to ensure a localization. Assistance can offered by a marketing service center. The results of my work show how marketing is practiced and used in successful internet startups. However, it still requires further quantitative research to examine the success effectiveness of each aspect. But I hope that I gathered some new insights that will help new and existing startups to optimize their marketing activities.